Next Meeting: Wednesday, November 14, 2018, 6:30 p.m. – 8:30 p.m.
Join us for our always-popular annual November tradition: Member-led mini hands-on workshops in the form of a card or mini-book exchange that we call Book Blitz and Card Tricks. Get prepared now and join the fun! Design a card or small/simple book structure that has a trick or two; maybe a pop-up, French doors or a window. Bring your completed card or mini-book, along with materials for six undecorated cards or mini-book structures to share. We will have an exchange and then engage in some decorating fun. Please feel free to join in the fun even if you don’t have time to prepare cards or mini-books to bring. We do a similar program every November and there is always more than enough to go around. As in years past, expect to go home with some great new ideas, several new tricks up your sleeve, and a few new cards for the season. Our yearly field trip to UVM Special Collections was indeed special. We met at their new home in Billings Library, a newly renovated space with historic appeal. I was wowed by the impressive fireplace and the rotunda-like room. 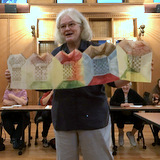 Also impressive was the collection of artists’ books chosen for us by University of Vermont Librarian Prudence Doherty. Her introduction to each book gave us a vision of the artist’s intent, while our time alone with the work let us delve deeper into the meaning and content. It was more about content this year, as many of the books concentrated on September 11 as well as social issues. A big thank you to Prudence for allowing us to enjoy these special books, and to everyone who attended. Did you know you can visit Special Collections any time? You can make an appointment with Prudence if you are interested in a specific structure or topic, or just show up and browse the collection of Vermont ephemera. 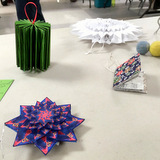 *** Rebecca Boardman will be teaching The Art of Paper Ornaments at the Barnet Public Library on Tuesday, November 27th from 6:30 p.m. – 8:30 p.m. All materials are included. You will make up to four different ornaments along with the skills you need to make more of them on your own after the class. To register, call (802) 633-4436 or email barnetpl@hotmail.com. *** Elissa Campbell is teaching Find Closure, a leather journal class at Studio Place Arts in Barre, VT on November 10, 2018. *** November is offering two book-related events in the Boston area. During November 16 – 18, the Boston International Antiquarian Book Fair will be held at the Hynes Convention Center. Among the events is an exploration of the contemporary world of book arts in Kyoto and Japan, from the perspective of one who has devoted a good part of his professional life to the study and appreciation of the history of the Japanese illustrated book. On November 17th, the Boston Book Print and Ephemera Show will be held at the Back Bay Events Center. The show specializes in antiquarian and vintage books, prints and ephemera. You can attend the event for free in the afternoon by registering for a pass. For more information, please visit the event websites.